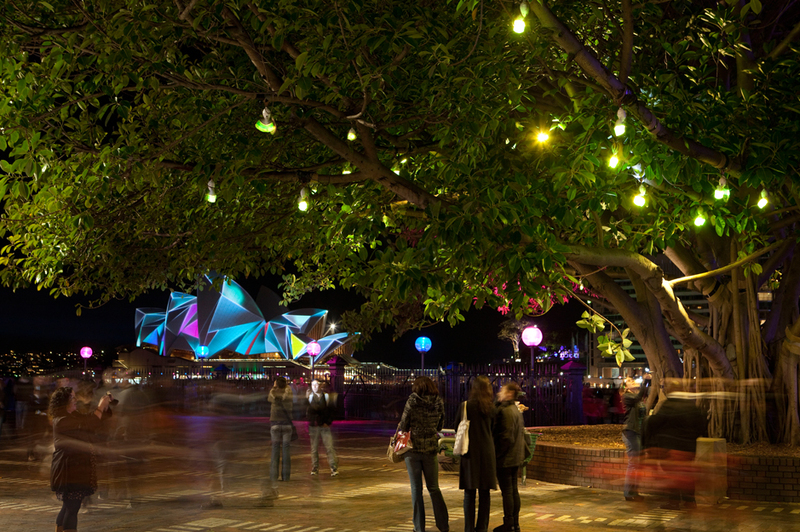 Social Firefly is a community of small, autonomous light robots first exhibited during Vivid Sydney 2011. Inspiration came from the emergent behaviour found in cellular communication systems such as those used by fireflies in synchronising their rhythms. The piece is an expression of the uncanny, unexpected patterns that arise in complex social networks, expressed through the movement and brightness of the fireflies’ light. The fireflies move and react to light from their neighbours, moving and buzzing in response to their neighbours. What follows is an organic and spontaneous demonstration of social interaction. Popular fireflies become highly influential, whilst isolated fireflies must work harder to reach their friends. By shining lights on the artwork, audience members can speak the same language and influence the interaction between the fireflies. The artwork is a demonstration of how interaction can be dynamic, beautiful and playful, as well as teaching us about our relationship to other creatures with which we share this earth. Social Firefly was created with the support of Arup. Arup is an independent firm of designers, planners, engineers, consultants and technical specialists offering a broad range of professional services. Through our work, we make a positive difference in the world. We shape a better world.